Exposure to a once widely used pesticide, DDT, may increase the chances of developing Alzheimer's disease, suggest US researchers. A study, published in JAMA Neurology, showed patients with Alzheimer's had four times the levels of DDT lingering in the body than healthy people. Some countries still use the pesticide to control malaria. Alzheimer's Research UK said more evidence was needed to prove DDT had a role in dementia. 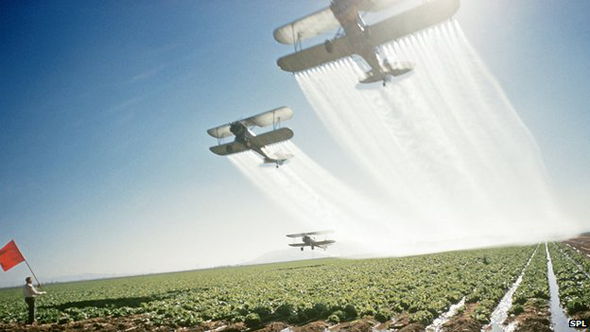 DDT was a massively successful pesticide, initially used to control malaria at the end of World War Two and then to protect crops in commercial agriculture. However, there were questions about its impact on human health and wider environmental concerns, particularly for predators. It was banned in the US in 1972 and in many other countries. But the World Health Organization still recommends using DDT to keep malaria in check. DDT also lingers in the human body where it is broken down into DDE. The team at Rutgers University and Emory University tested levels of DDE in the blood of 86 people with Alzheimer's disease and compared the results with 79 healthy people of a similar age and background. The results showed those with Alzheimer's had 3.8 times the level of DDE. However, the picture is not clear-cut. Some healthy people had high levels of DDE while some with Alzheimer's had low levels. Alzheimer's also predates the use of DDT. The researchers believe the chemical is increasing the chance of Alzheimer's and may be involved in the development of amyloid plaques in the brain, a hallmark of the disease, which contribute to the death of brain cells. Prof Allan Levey, the director of the Alzheimer's Disease Research Centre at Emory, said: "This is one of the first studies identifying a strong environmental risk factor for Alzheimer's disease. "The magnitude of the effect is strikingly large, it is comparable in size to the most common genetic risk factor for late-onset Alzheimer's." Fellow researcher Dr Jason Richardson added: "We are still being exposed to these chemicals in the United States, both because we get food products from other countries and because DDE persists in the environment for a long time," . Dr Simon Ridley, the head of research at the charity Alzheimer's Research UK, said: "It's important to note that this research relates to DDT, a pesticide that has not been used in the UK since the 1980s. "While this small study suggests a possible connection between DDT exposure and Alzheimer's, we don't know whether other factors may account for these results. "Much more research would be needed to confirm whether this particular pesticide may contribute to the disease." Does deafness contribute to dementia?